Come and join the Rhodes College Lynx Women’s Soccer Summer College ID Clinic. It is a full-day event that will run from 9 o’clock in the morning until 4 o’clock in afternoon on the 9th of July. It is going to take place at the scenic Rhodes College campus in Memphis, Tennessee. This summer identification camp is especially for prospective college female soccer players. Moreover, it is especially for those who have a club or high school varsity playing experience. The program aims at fine-tuning the player’s technical abilities and tactical understanding. It also includes a campus tour and a college recruitment talk. In addition, the attendees are going to be immersed in a real collegiate level training atmosphere. It is also an opportunity to train and learn from the Rhodes College Lynx women’s soccer coaching staff and current players. Furthermore, the participants are requested to bring their own soccer ball, gears, and equipment. It is going to be a physically demanding but enjoyable experience. Rhodes College is a private institution with a former affiliation with the Presbyterian Church. It is now a liberal arts college in Memphis, Tennessee. Its campus is 100 acres in size and notable for the Gothic architecture of their buildings. Thirteen of these buildings are in the National Register of Historic Places. Additionally, Rhodes College is a member of the Consortium of Liberal Arts Colleges, the Associated Colleges of the South, the Annapolis Group, and the Oberlin Group. The college’s rank in the 2018 edition of the US News and World Reports Best Colleges for National Liberal Arts Colleges is 51. Currently, it has a total undergraduate enrollment of 1,999. The gender distribution is 44% male students to 56% percent female students. The student to faculty ratio is 10:1. In fact, 71.1% of the school’s classes have less than 20 students. Academically, Rhodes emphasizes in student research and writing and encourages students to participate in “service learning” off campus. The Rhodes College mascot is the Lynx. Their athletic teams are competing in the Southern Athletic Association in the National Collegiate Athletic Association Division III. Their identity colors are cardinal and black. 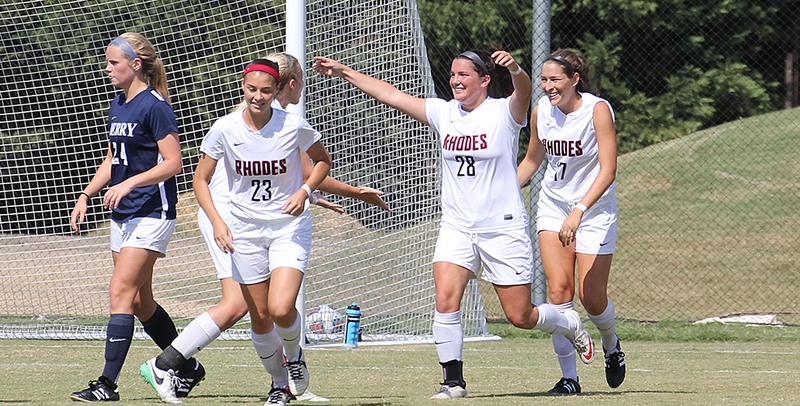 Katie Chambers, a native of Sleepy Hollow, Illinois is the head coach of the Rhodes College Lynx women’s soccer team. She is now entering her second season at the helm of the college’s women’s soccer program. Coach Katie Chambers is a bachelor’s degree in physical education and a minor in coaching graduate from Loras College. Additionally, Coach Chambers is the former Gettysburg College assistant coach and the former Misericordia University graduate assistant coach where she was working primarily as the goalkeepers’ coach. Coach Katie Chambers was part of the Misericordia University Cougars’ 2013 and 2014 Freedom Conference champion team. Furthermore, Coach Chambers was also a former standout goalkeeper. As a matter of fact, she was a two-time All-Iowa Intercollegiate Athletic Conference (IIAC) selection and a one-time first-team selection. Coach Katie Chambers was instrumental in the Loras College Duhawks’ Iowa Intercollegiate Athletic Conference (IIAC) championship runs and NCAA Tournament Sweet 16 finish. She was an NCAA Division III All-Midwest Region selection during her senior year. The Rhodes College Lynx Women's Soccer Summer College ID Clinic is set to run from 9:00 AM until 4:00 PM on the 9th of July. It is inviting all high school female soccer players with playing experience in a club or varsity level. This summer identification clinic is going to be under the direction of the Rhodes College Lynx women's soccer coaching staff.